Ludwig Van Beethoven is arguably the most famous and well known classical musician and composer in all of history, but his true identity and ethnicity has been a falsehood and obscurity for many, many years. Society has depicted him as a white male with either blonde or brunette colored hair, being shown in drawings, paintings, and illustrations all over the world. But in reality, Beethoven was labeled by many as a “Mulatto”, or “Black Spaniard”. But why? Well, according to Gabriel Scott, historian and author of The Chosen Ones: Perception of Malcolm and Martin, his father was a white German and his mother was a “Moor”. At the time, the term “Moors” was used to refer to a group of Muslim Northern Africans... or generally speaking, people who were of African descent or even Negros. In society, with the Black gene being the most dominant, he was referred to as a Black man often by his friends and people that he associated with. In fact, several people are documented as saying that he had brown skin, black frizzy-wooly hair, a thick-wide nose and a short neck. 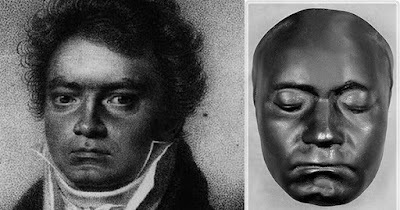 Some resources claim that Beethoven was often forced and/or pressured to wear white powder on his face to hide his ethnic origin when out in public. He allegedly also used body doubles for portraits, and “euro-centric” historians, hiding the truth of his genetic heritage. Nevertheless, Beethoven's story is very interesting and inspirational. At the young age of 21, he moved from Germany to Italy and began studying composition and quickly gained a reputation as a virtuoso pianist. However, during his late 20's, his hearing began to deteriorate, and he eventually became almost completely deaf. But his disability did not end his music career. In fact, during the last 15 years of his life, he composed and published many of his most admired works in classical music. All in all, his compositions include nine symphonies, about a dozen pieces of "occasional" music, seven concerti, as well as four shorter works that include soloists accompanied by orchestra. His only opera was Fidelio. But most interesting is that this musical genius who people have thought for centuries was a white man, was actually in fact... Black.